Once again fall is approaching and the same problems persist each year with new ones coming and going. Before we talk pet health I would like to share a picture my wife Karla took while on her lunch hour walk in the Olentangy Park in Worthington close to where the MedVet emergency/specialty vet hospital is located. 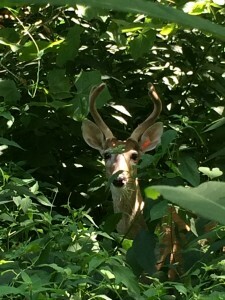 This is a young adult male White-Tailed Deer with velvet still on his antlers. White-Tailed Deer grow an entirely new rack of antlers each year after shedding the previous year’s when breeding season is over. The fuzzy tissue you see is referred to as “velvet” and is actually the tissue and blood vessels that grow the bony antler inside the covering. When late summer and fall arrive the Bucks rub off the velvet as it dries up and dies. The antlers also harden at this time. The change occurs due to a rise in testosterone hormone levels. As you would expect next comes the breeding season triggered by the shortening of the day. It begins in October and extends into December. As the testosterone levels drop later in the winter the antlers fall off. This explains the many antler arrangements we see that have no “heads” attached! Winter in central Ohio is not as hard on pets as extreme heat but we occasionally see frost bite and hypothermia cases. Stacy our receptionist has a cat she rescued that hid in a metal pipe for a wind break during a severely cold night. Unfortunately anyplace the cat’s skin touched the metal pipe it developed frostbite and lost the skin from those regions. It took a while but finally all involved areas scarred in without needing skin grafts and healed so they were no longer painful or infected. Older pets and pets with other health issues are most susceptible to the effects of cold. Outdoor pets should always have a windbreak in their enclosure and water that is not frozen. This may require providing new water multiple times a day. I do not recommend hay in dog houses for insulation. It may be fine but many dogs become allergic to the molds that grow on the hay that dampens from the dog’s breath. A blanket that can be washed with bleach periodically is less of a problem. Pets remaining outdoors in cold weather have an increased need for food. They need their normal requirements and in addition the calories they must burn to keep from freezing. It is never wise to leave a skinny pet out as winter approaches. They have no insulation and it is difficult for them to accumulate any fat since they burn more calories to keep warm than the same pet that is not skinny as the temperature drops. Sudden changes are most severe. A pet can adjust gradually to cold temperatures but to put an indoor pet outside when very cold can be too much too fast for the body to be able to adjust. Last winter we experienced days that even pets continuously kept outdoors needed to be brought in. Sudden extreme drops are dangerous to the sturdiest pet. Smaller pets chill faster than larger ones since they have a larger surface area for each pound of body weight. Many owners are topping off radiators with antifreeze and many of the brands available are still toxic. Ethylene Glycol is the toxic antifreeze that causes kidney failure. All the other compounds are safer. One lick of EG can be a fatal dose for a cat. It has an appealing taste that increases the danger. Treatment at the time of ingestion is necessary if a toxic dose is swallowed. Once the pet is sick it is generally too late to save the kidneys. Running the furnace too warm can create problems in the winter since a higher temperature generally leads to a lower humidity and mucous membranes of the airways dry out and also the skin. Static electricity is a sign you have the setting too high. Dry skin creates only mild itching so if your pet is very itchy see us since it is more likely to be allergic skin problems. Molds and house dust mite are prominent winter allergens when pets spend more time indoors with a furnace running making some allergens more airborne. We actually see the most respiratory disease in pets when weather is changing with temperatures up and down versus steady temperatures they become accustomed to. If you have had ongoing flea problems continue your treatments into the winter to prevent fleas from breeding in basements or crawl spaces when it is too cold outside. Also continue your heartworm prevention. It has been shown that in central Ohio there is really no month that is considered free of the chance for heartworm infection. One other insect that loves to move indoors in the winter is the spider. All species but especially the big creepy ones that make my wife scream bloody murder! Dogs and cats reacting to spider bites is the explanation for many mysterious winter swellings and rashes on pets. The Brown Recluse is very toxic and can cause severe reactions. Most insect related sudden reactions in house pets in winter are usually spider related.